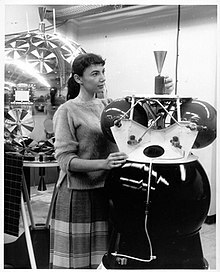 Judith and the Atlas / Able satellite on which she worked in 1959. Judith Love Cohen was an American aerospace engineer and author. Cohen worked as an electrical engineer on the Minuteman missile, the science ground station for the Hubble Space Telescope, the Tracking and Data Relay Satellite, and the Apollo Space Program. After her retirement as an engineer, she founded a children's multimedia publishing company, eventually publishing more than 20 titles before her death in 2016. Cohen was born in 1933 in Brooklyn, New York, the daughter of Sarah (Roisman) and Morris Bernard Cohen. By fifth grade, Cohen's classmates were paying her to do their math homework. Cohen was often the only female in her math classes, and decided she wanted to be a math teacher. By age 19, she was both studying engineering in college, and dancing ballet in the Metropolitan Opera Ballet company in New York. Judith received a scholarship to Brooklyn College to major in math, but realized she preferred engineering. After two years at Brooklyn College, Cohen married and moved to California, working as a junior engineer for North American Aviation, attending USC at night; she said that she went through both her BS and MS programs at USC without ever meeting another female engineering student. She received both her Bachelor's and master's degrees from USC Viterbi School of Engineering, and has continued her association with the university, serving as an Astronautical Engineering Advisory board member. In 1982, Cohen became a graduate of the UCLA Engineering Executive Program as well. Cohen's engineering career began in 1952, when she worked as a junior engineer at North American Aviation. After graduation from USC Viterbi School of Engineering in 1957, she went on to work at Space Technology Laboratories. Space Technology Laboratories eventually became TRW (acquired by Northrop Grumman in 2002). Cohen stayed with the company until her retirement in 1990. In 1990, after retiring from practice as an engineer, Cohen began a publishing company called Cascade Pass with her 3rd husband, David Katz. They published two series of books: (a) the "You Can be a Woman … " series was created to encourage very young girls to pursue careers in science and engineering; (b) the "Green" series focuses on promoting positive environmental practices, aimed at young children. Cascade Pass has sold more than 100,000 of their children's books in these two series. Cascade Pass has also published a book called "Women of Apollo" (written by Robyn Friend), which features short biographies of four women who helped put the first man on the moon, Judith among them. In May 2014, Cohen received the IEEE-USA Distinguished Literary Contributions Award for her work with STEM for children. Cohen was the mother of four children, including well known engineer/scientist Neil Siegel and actor Jack Black. She had her first three (Neil, Howard, and Rachel) with Bernard Siegel, who she met in college and married a few months later. Cohen and Siegel divorced in the 1960s, and Cohen later married Thomas William Black. Her fourth child, Jack, was born in 1969. Cohen and Black divorced in the late 1970s. Her third husband was David Katz. They were still married when Cohen died of cancer in 2016. ^ a b Friend, Robyn. The Women of Apollo. Cascade Pass, Inc. ISBN 1-880599-79-1. ^ "Women in the Workplace / Judith Love Cohen: Engineering a Change: A Hubble telescope designer aims to rewrite the book on careers for girls with a series of stories about women in math and science". latimes.com. LA Times. Retrieved 1 August 2014. ^ a b c d e f g Siegel, Neil (29 July 2016). "In Memory of Judith Love Cohen: Mother, Wife, Friend, Author, Engineer". USC Viterbi School of Engineering. Retrieved 9 January 2019. ^ a b Tawa, Renee (6 September 1999). "Women in the Workplace / Judith Love Cohen: Engineering a Change: A Hubble telescope designer aims to rewrite the book on careers for girls with a series of stories about women in math and science". LA Times. Retrieved 1 August 2014. ^ Coopersmith, Sandra (29 May 2014). "Guiding Girls to Lofty Goals". Culver City Observer. Retrieved 6 August 2014. ^ "Jack Black". last.fm. Retrieved 12 August 2014.